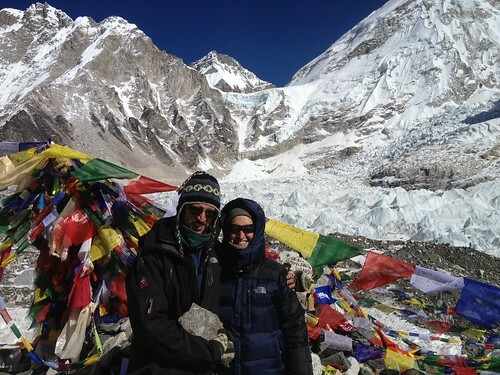 We Reached Everest Base Camp! We Reached Ever­est Base Camp!, a photo by tf_82 on Flickr. On day 9 of 13 on our trek we reached 5335 metres. The sub zero nightly sleeps were worth the spec­tac­u­lar views. One more day of hik­ing to go until we catch a flight back to Kath­mandu. Stay tuned. This entry was posted in Nepal, Street Photos on 19 November, 2013 by Tim Fisher. Won­der­ful pic­tures! I am wait­ing for a full reportage on your trek! Me so proud of you guys!! Fan­tas­tique tour du monde avec le toit du monde!!!! Bravo à vous deux, vous êtes extraordinaire.. WOW!!!!! Sit­tin’ on Top of the Woild!!! WOOOOOOHOOOOOOO!!!!! That’s AMAZIN!!!!!!! Soooo proud of you guys!!!!!!!!!! YEAHHHHHH!!!!! And you even walked back ! Nice one ! Proud of you guys. Thanks every­one for your sup­port! It was an amaz­ing expe­ri­ence and we can’t wait to share it on the blog. Now we just need to find some time to get the site up to date!